If you haven't already seen my first post on my bedroom renovation plans and a couple of before pictures, you can check that out here. The room is about halfway done now and I have so much to update you on, but I thought I would start with the most experimental part of the room and the part that has received the most questions -- the floor. For a long time I just assumed there was nothing I could do to update the floors when renting a place, but I've always pictured pretty wood floors all over the house! An idea was sparked when I was looking for an outdoor floor for someone else, and came across those temporary dance floors that click together for an event like a wedding... set it up in an hour and take it down at the end of the night. I wondered if that would work in our bedroom or if another version of that existed for renters. I did find a few other click-together floor tiles, but none of them were super pretty. Most of them looked really fake or too bulky, so I let the idea go for awhile, but periodically browsed the internet for other options. During one of my browsing sessions, I found someone who had used vinyl flooring (like the kind you normally install after ripping out old carpet) but had just set it on top of their carpet, and that's it. (!!!) I found another couple who had put down thin pieces of plywood on top of their carpet and the vinyl flooring on top of that for something a little more sturdy. I realized this was exactly the solution I had been searching for (AT LONG LAST). Since our carpet is low pile (super short/flat) and sturdy, I decided to try it the simplest and cheapest way of just laying the flooring directly on top of the carpet, thinking I could add the plywood underneath later if necessary. It totally worked and I was sooo excited. I got this Rosewood flooring from Home Depot and it came in one huge roll. (It arrived over a week late, but Home Depot customer service was incredible, and they refunded a ton of the cost to make up for that). It was pretty heavy but mostly it was very very long and I did not pay for the service to bring it upstairs to my bedroom (I should have, maybe) because I didn't realize how difficult that would be. Thankfully, I had the help of my husband and friend, but it still took a lot of figuring out. At one point we had one end of the floor out the upstairs window so that it would fit around the corner to the bedroom. We eventually figured it out, but if it's not working for you, the other option is to roll it out outside and cut it into pieces that would fit. I'm not sure if it would lay on top of the carpet well if it were in multiple pieces, though. Since it was one big roll, all I really had to do was get it to my bedroom, roll it out onto the floor and then cut off the extra on the sides. One reason I chose this floor was because it was almost the same size as my room -- just a couple extra inches on both sides. It was a challenge to do completely on my own but probably would have been pretty easy with one other person. The biggest challenge was getting the floor under my bed because I didn't have the space to move it out of the room (hah), but obviously if you take all of the furniture out it's way easier. Once it was all rolled out, I used a flooring knife (less than $5!) to cut the two sides with extra length. To be honest, my cuts are very uneven and look awful, but both of them are covered for the most part by my bed and some other furniture, so I didn't worry too much about it. I tried all sorts of techniques and I'm still not sure how to cut more evenly yet. 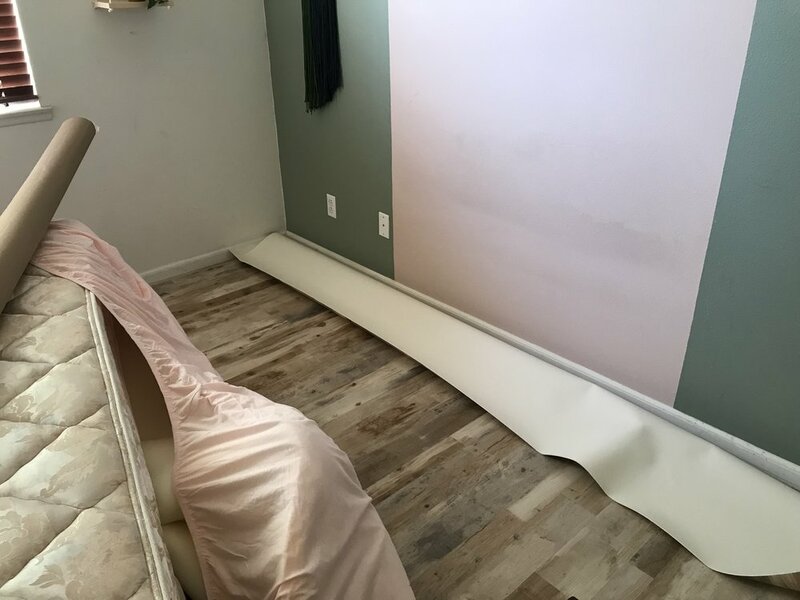 Usually, if you installed this kind of floor the normal way, some of that would be covered by the baseboard that you add after the floor, but that's not the case this way! I'm sure YouTube has some ideas on how to make more even cuts. The last thing that was a big challenge was getting out the "bubbles" of air underneath the floor. Surprisingly, the floor doesn't squish too much from stepping on it (yay), but the super heavy furniture does cause an indent to some degree, so moving any furniture around on the floor causes the floor to move around and become uneven. We were able to correct most of that, but it's definitely a two-person job since the floor is heavy, especially once it has furniture on top. If you get it all set up, and then lift all of your furniture instead of pushing/dragging, then it should be mostly fine. There are still a couple of bubbles throughout the floor that we haven't been able to remove -- you can't see them super well but you just feel them when you walk on them. I installed this faux brick wall this same day... post on that soon! Overall, it's definitely not the same amazing-ness as actually installing a new wood floor the proper way would be, but it has changed the feel of the room 100% and I'm SO glad we decided to go for it. If you're a details person when it comes to things being done the proper way, you'll probably be a little annoyed, to be honest, but personally, I'm more impacted by the way my room looks than the actual quality of each item, so I loveeeee it. Hopefully one day I can do this to the rest of the house, and definitely plan on rolling the floor back up and bringing it along when we move to another place one day. I would love to try other looks too, like a faux tile floor. I like this one for a retro feel and this one for a Spanish-style home! So much more has been done since installing the floor (like a faux brick wall, new bedding and some updated night stands) so I will post about all of that soon. Stay tuned! I am gradually overcoming my fear of the hardware store, so I'm going to start including shopping tips for each project so that you know exactly what to ask for when you walk in or order online! 1. All you need is the floor and the flooring knife, and you can order both online! 2. Look for a floor that comes as a roll, not individual tiles. Keywords to look for are "sheet flooring," "full roll," or "vinyl sheet," and the measurements in the description should be several feet, not just a few inches. For example, this is a big roll (good), and these are individual tiles (bad). 3. Most of the floors can be ordered kind of like fabric -- they have one fixed width, but then you choose how long you want the piece to be. They are often priced per linear foot, so if you add 1 to your cart, you are adding a piece that is one foot long. A few of the floors on the Home Depot site have a calculator on the listing, so you can just enter the square footage of your floor and it will tell you what to order.